During the last decade, hingeless rotorcraft has been the subject of substantial research, development, and testing, because of their reduced maintenance, unpowered performance, and better flying qualities. Production of hingeless rotorcraft is now under way. Experience has shown that. compared to articulated rotors, hingeless rotors are more demanding With respect to the dynamic design. Structural Integrity, good handling qualities, and flight stability depend on a proper assessment Of the dynamics problem, much more so than for articulated rotorcraft. elasticity, 'S not applicable for rotorcraft, especially hingeless rotorcraft. Elastic blade deformations greatly affect handling qualities and must be Included In a discussion of hingeless rotorcraft flight dynamics. Here, a somewhat arbitrary line IS drawn b•tween flight dynamics and structural dynamics. resonance phenomena and other low-frequency Instabilities In flight belong to flight dynamics and are included here. only those for the Inner loop are considered s.nce they can strongly couple with the elastic rotor modes. This survey report 's not directed primarily to the dynamics specialist but rather to the rotorcraft design engineer who wishes to be introduced to the flight-dynamics problems of hingeless rotorcraft and to the methods for their solutions known to date. Chapters 1 to 6 are almost purely dexr.pt.ve with a few Simple equations in chapter 4 that define several blade coupling parameters and, In chapter 6, that define several feedback parameters. Chapters 7 and 8, m addition to descriptive material, also contains mathematical formulations of the basic methods discussed. 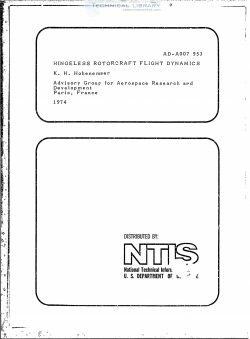 Most of the literature is Cited in chapter 2, on the history of hingeless rotorcraft.